(DAILY SIGNAL)—On Thursday, Obama administration officials indicated that the president was considering a fundamental shift in U.S. policy. Instead of using its veto to block United Nations Security Council pressure on Israel in peace negotiations with the Palestinians, the administration is now reportedly considering endorsing this effort. It is hard to overstate the seriousness of such a policy change. For decades, the U.S. has used its veto in the U.N. Security Council to shield Israel from undue pressure from the world body, which has historically exhibited bias against Israel. "[I]t is bitterly unjust that the United Nations—an institution founded upon the idea that all nations should be treated equally—is so often used cynically by Member-States to treat Israel unequally. These attacks on Israel's legitimacy are biased. They are ugly. And the United States of America will not rest until they stop." 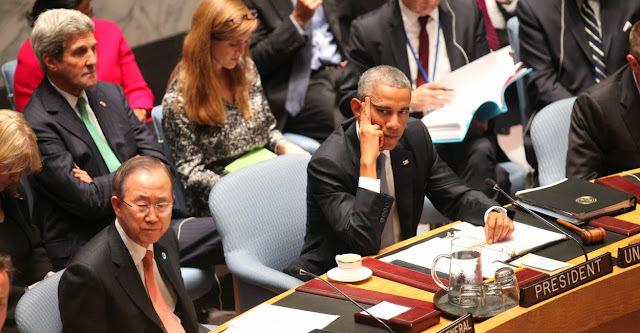 Indeed, according to U.N. records, the U.S. has used its veto in the Security Council 79 times. Forty-two of those vetoes were cast to block resolutions deemed to be biased against Israel or harmful to the Israeli-Palestinian peace process. In fact, America's most recent veto was cast by the Obama administration in 2011 to block a resolution condemning Israeli settlements.